Today I met an alligator. A new one. A little over a week ago I had met a few others; a pile of babies, some smallish – maybe teenagers – at a safe distance and one a little larger and closer than I was comfortable with. I quickly took his picture then pretended to be invisible. I came upon my new friend today peeking through the water grasses. He at me, me at him. When our eyes locked he asked if I had a minute. I said, sure, but I’m going to stay here on the land and I ask that you stay there in the water. He agreed. He wanted to teach me a few things. He shared some information about himself and offered quite a bit of advice on his observations of me. Terribly talkative and opinionated, but I listened nonetheless. About himself, he shared that he was perfectly happy sitting in the cool water with just bits of him visible to the world and the sun. He said during warmer times of the day he may meander onto the bank to soak in some solar energy but that often caused humans to run toward him or away from him. In any case, the ruckus unnerved him, causing him to whip his big tail around and head back into the water. So why not just stay here most of the time? He also told me he wasn’t hungry and if he were there were certainly much smaller and less combative morsels than humans to be had. He was telling me, for the most part, I was safe. I think he rolled his eyes a little here, it was hard to tell. He told me it was okay to take his picture, I could even get closer as long as I didn’t make fun of him or show any disrespect. His skin may be leather but he still has feelings. And he shared quite a fantastical tale about the millenia his people have roamed the earth and what they’ve learned and THAT’S why I’m still lucky enough to see him. He could have come off quite condescending, but I found him almost charming in a-conversations-with-a-dragon sort of way. Then he started telling me about me. I listened at first with resistance but what he had to say made some sense and ‘his people’ have survived a lot, so I listened. First he told me I did not have to fear him. And by that he meant I simply did not have to have fear. I should quiet my mind enough to trust my gut, to use my senses rather than my ego and all its programming. He reminded me that I too am nature, that I have the ability to adapt to whatever surroundings I find myself in and to know the differences. 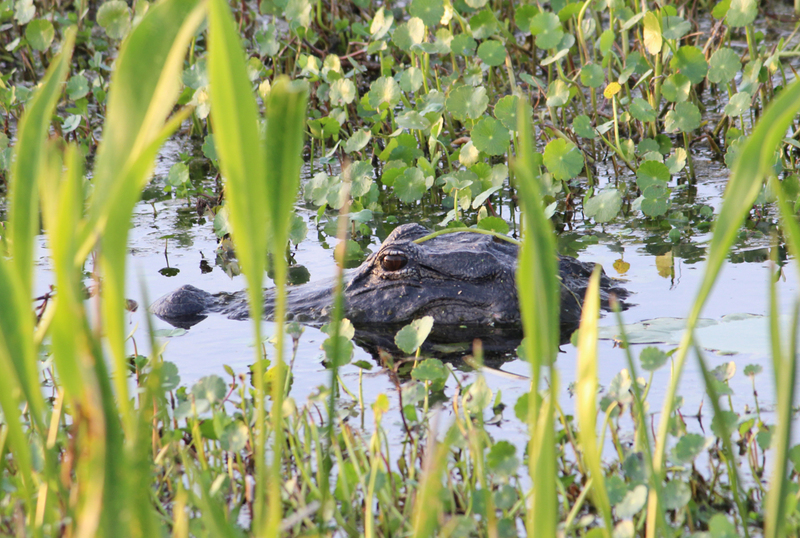 He wanted me to know that I am not the alligator whisperer, nor is he the human whisperer. He said he often talks to others like me, but they don’t always hear. Instead they spend a lifetime avoiding that which is not coming toward them anyway. They spend so much time walking a wide berth around a perceived threat that they miss the magic it may show them. That seemed to make him a little sad. Me too.